Your body is a precision machine. 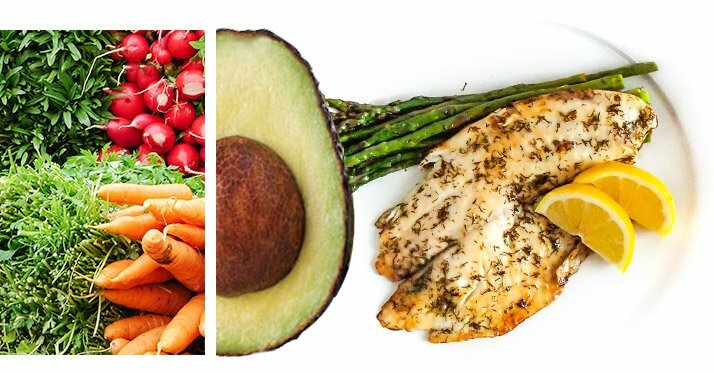 Treat it like one with this meal-by-meal breakdown of the optimal nutritional day. Representing the greatest combination of speed and handling ever devised, a Formula One race car is a marvel of mechanical engineering. Every square inch of the car is exhaustively scrutinized in pursuit of tweaks that can mean as little as a tenth of a second difference in lap times on race day. When you bear in mind that Lewis Hamilton's closest margin of victory in winning 11 of 19 races in his 2014 championship campaign was a mere 0.636 seconds, the dedication to infinitesimal details becomes understandable. In this 225-mile-per-hour world, where teams vie for $800 million in prize money each season, every input matters, from the petrol to the tires to any of the hundreds of exquisitely calibrated pieces that make up the V-6 turbo engine. Such a level of dedication to detail should sound eerily familiar to a committed fitness enthusiast, because inputs also matter when it comes to the world's most complex living machine: the human body. "To maximize your strength, muscle mass, agility, speed, and stamina, you need the correct food, supplements, and training in the optimal amounts." To maximize your strength, muscle mass, agility, speed, and stamina, you need the correct food, supplements, and training in the optimal amounts. Otherwise, like an F1 car powerlessly rolling to a stop, your relentless pursuit of your physical goals could come up short. With that in mind, and with help from the research team at RSP Nutrition, we've assembled an ideal day of performance nutrition. This plan will take the average 180-pound male from start to finish! To figure out your own daily calorie intake, a simple but effective formula is to multiply your body weight by 18-20. For your macronutrient breakdown, multiply your body weight by 1 for your target protein intake and 2 for your target carbohydrate intake (in grams). The remainder should be mostly healthy fats. Immediately upon waking, you'll need to do two things (after, of course, your personal pit stop). First, drink a glass of water, says RSP Nutrition Athlete Tiffani Bachus, an Arizona-based nutritionist and 2009 Fitness America World Champion. "It's always good to start the day rehydrating the body with water first thing in the morning," she says. "Our bodies are in a dehydrated state after losing fluid via respiration, urination, and sweating over the course of the night." Second, you need to break your overnight fast and put key nutrients to work. 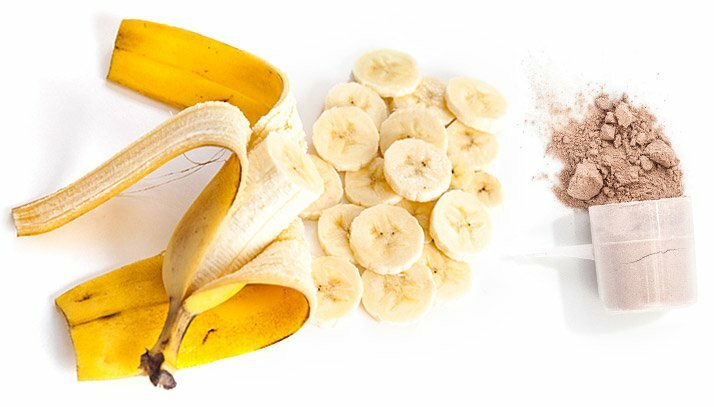 While you'll go light on food—a banana blended into a whey protein shake is always a good choice—you'll want to supplement a number of key substances, including branched-chain amino acids (leucine, isoleucine, and valine), a nitric-oxide (NO) booster, and glutamine. This is, by the way, not your breakfast, which will come a bit later. An hour or so after that you'll want to sit down for a more substantial breakfast, which can include scrambled eggs, steel-cut oatmeal (which is lower on the glycemic index than rolled oats), and a handful of berries. Black coffee is okay here too. With this meal, take your multivitamin/mineral, along with additional vitamin C for its host of benefits to your immune system and its ability to guard your NO levels. The enemy of anyone seeking physical improvements—whether strength, muscle mass, or endurance—is long stretches of fasting throughout the day. It may sound like a good idea to starve yourself and avoid food if you're looking to drop body fat, but that approach backfires. Within your body is a constant yin and yang, where you're either growing and repairing (an "anabolic" state) or breaking down tissue to use as fuel (a "catabolic" state). Going too long without food will activate the latter process. Unfortunately, when that happens, your body's preferred source of sustenance is your circulating amino acids and even muscle, meaning you could be losing the very tissue you're working so hard in training to build. 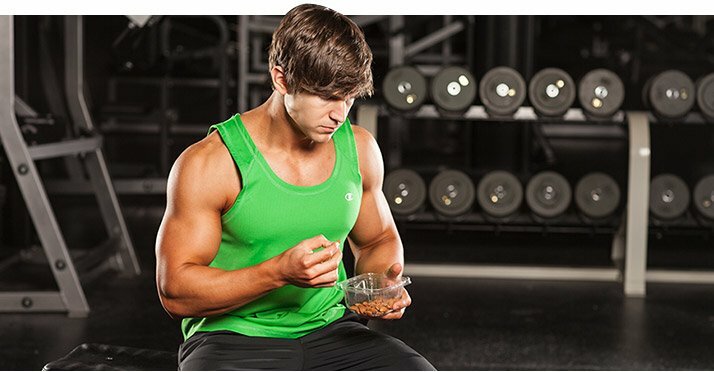 To remain anabolic, eating small, frequent meals throughout the day is important. Eat every few hours. Have clean, healthy snacks on hand when you get hungry between meals. For instance, 2-3 hours after breakfast, have a small meal of protein, complex carbs, and some unsaturated fat. Protein can be turkey or chicken breast, jerky, cottage cheese, or eggs, or even a protein shake. Complex carbs can be whole-wheat bread, sweet potatoes, or brown rice. And your dose of healthy fat can come from peanut butter, almond butter, or avocado. Around noon, it's time to refuel again, this time with a clean, simple meal of protein and quality carbohydrates. Chicken breast, turkey breast, or a lean cut of beef paired with broccoli and carrots is perfect; you can also add a green salad topped with olive oil and vinegar. Take this opportunity too for a dose of vitamin D, which boasts health benefits and aids in muscle contraction. About 30 minutes before training, it's time to start revving your engines and priming your body for the high-octane work to come. To make it easy, stick with supplements, anchored with a whey protein shake, along with arginine, BCAAs, glutamine, and creatine. A pre-workout supplement that includes a range of beta-alanine, caffeine, L-tyrosine, L-glycine, and taurine can give you an edge as well. And during your workout, stay hydrated with plain ol' water for shorter workouts, and a sports drink diluted with water for longer endurance sessions. Benefit: Dilates blood vessels, increases "pump"
"Coordinating nutritional consumption around your training can provide sufficient energy, help with recovery, reduce muscle breakdown, aid in muscle building, and promote hypertrophy," Bachus explains. "This is especially true regarding the post-exercise period known as the anabolic nutritional window of opportunity. By eating the right foods, insulin and other hormones and enzymes that are involved with restoring glycogen are at their peak and very responsive at this time. The addition of protein or amino acids further enhances its response." Now's not the time to let up on the gas here, nutritionally speaking, because your muscle glycogen has been highly depleted following a hard training session. 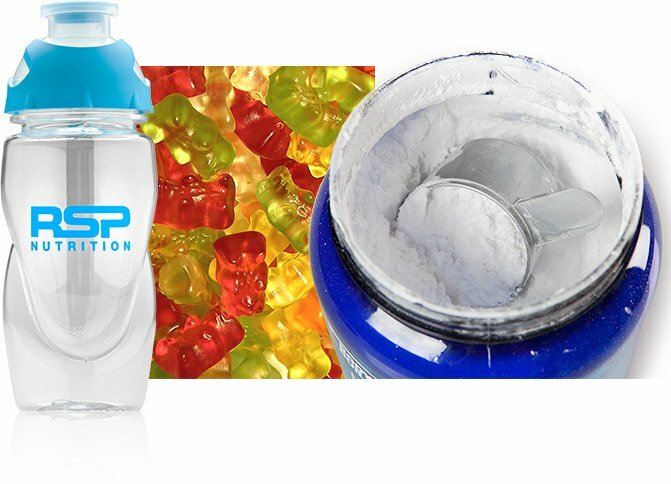 Within 30 minutes of your last rep, down a protein shake that includes both casein and whey in equal amounts (15-20 grams each), as well as quick-digesting carbohydrates from pure dextrose powder, white bread, or a "cheat" food like gummy bears or jelly beans (seriously). Take advantage of this window if you have sugar cravings, because it's after workouts that you want the fastest-acting carb source, which serves as the spark plug to help shuttle amino acids to damaged muscles. Here, you can also use an all-in-one post-workout supplement that delivers whey protein, glutamine, and BCAAs in one potent formulation. Here on the last turn, a perfect race can easily get derailed. Many of us raised on hearty family dinners—or those who have skimped on eating throughout the day—are prone to overeat, taking in way too many calories at one sitting. Instead, keep your wits about you and stick to the simple formula you used for lunch, pairing a clean protein source with vegetables. If you don't choose a fatty fish like salmon as your meat source, this meal is a good opportunity to take a fish oil supplement. Before dropping the checkered flag on your day, you'll want to set the stage for recovery and growth overnight. That means a protein shake made with casein protein. Casein is slower-digesting than whey, meaning it'll continue to deliver aminos to your muscles over many hours. A dose of zinc magnesium acetate, or ZMA for short, may also help as a sleep aid. If you can, drink the shake about 30 minutes before bed, and then take ZMA right before sleep. Personal trainer, fitness model, RSP Nutrition athlete, and amateur bodybuilding competitor Abel Albonetti has learned a lot through trial and error in readying himself for photo shoots and competition. The results speak for themselves. Here are the top five foods he uses daily to fuel up and grow. "Chicken is my number one source of protein because I truly don't ever get tired of the taste. You can cook it all different ways to make it less boring, and it's a great source of lean protein (19 grams per 3 ounces)." "Broccoli is something I eat on a daily basis, about two times per day. It's high in fiber (2.5 grams per cup), so it helps keep me full longer, and it has been shown to help reduce inflammation and lower levels of LDL cholesterol. "White rice is a great carb source for me that helps to provide energy and, when paired with a lean meat, promotes muscle growth." White rice is considered high glycemic, and hence is best eaten post-workout. "Almonds are probably my favorite source of healthy fats. Many studies have shown that almonds help to reduce some of the more damaging kinds of cholesterol, potentially decreasing the risk of heart attack." "Not everything you eat has to be strictly to fuel your body. I'm a firm believer in balance, and pizza is one of my favorite refeed meals. Just as it is important to provide your body with the right nutrients, it's also important to treat yourself on occasion. I normally allow myself a refeed meal about once per week." Stephens, F. B., Wall, B. T., Marimuthu, K., Shannon, C. E., Constantin-Teodosiu, D., Macdonald, I. A., & Greenhaff, P. L. (2013). Skeletal muscle carnitine loading increases energy expenditure, modulates fuel metabolism gene networks and prevents body fat accumulation in humans. The Journal of Physiology, 591(18), 4655-4666. Is your chest all show and no go? The superset-driven workouts of Abel Albonetti and Kizzito Ejam will fix that—if you can survive the onslaught. Nutrition plays a huge role in athletic performance. No matter your sport, you'll be a lot better once you implement these 5 nutrition tips!